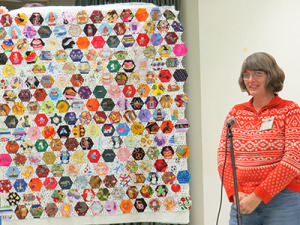 Several times a year, speakers at Quilters by the Sea’s monthly meetings offer workshops on specific aspects of quilt making. For upcoming workshops, see our Calendar. To register for a workshop, please download and print the Workshop Registration Form. Please indicate which workshop you’re interested in. Please return it to Lori Bessette at the next Quilters by the Sea meeting or send it by mail with a check to the mailing address in your membership list. Full payment is expected at sign up to ensure your place in class. Checks should be made payable to Quilters by the Sea. Please write the date of the workshop in the memo line. Refunds are given only if your space is filled from a waiting list. In the case of a medical or family emergency, on a case by case basis, the guild may issue a certificate towards a future workshop in lieu of a refund. In the event a workshop does not fill one month prior to the event, the workshop will then become open to non-members such as other guilds, guests, etc. If a minimum number of students is not met, the guild reserves the right to cancel the workshop and all student fees would be refunded. Workshops will be scheduled at various locations. Half day workshops begin at 9:30 and end at 12:30, full day workshops begin at 9:30 and conclude at 3:30 with cleanup until 4:00. Please bring a lunch or plan to go to one of the many spots nearby to grab a quick lunch. The guild will provide ironing boards and irons when needed. Perfecting your applique skills. The workshop will be held at St. Philomena’s School, 324 Corys Lane, Portsmouth, RI.